We’d love your help. Let us know what’s wrong with this preview of Corpse Cold by Allan Batchelder. Long Pete wants revenge against the slavers who murdered his wife and even now hold his only child cap Betrayed by his closest friend, someone who has also stolen his most precious possession, Tarmun Vykers wants revenge. 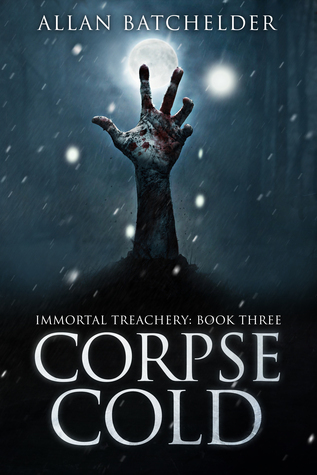 To ask other readers questions about Corpse Cold, please sign up. Another great installment in the Immortal Treachery series!!! The story starts of with main character Vykers in a difficult situation after the events at the end of the previous book. I thought this a nice surprise then, and I loved it how Vykers dealt with it now. I probably liked the first part of the book the best with Vykers in search of a solution for his predicament. But even after that the story remains interesting to follow. And even though the story doesn't have as many 'breathtaking' sc Another great installment in the Immortal Treachery series!!! The story starts of with main character Vykers in a difficult situation after the events at the end of the previous book. I thought this a nice surprise then, and I loved it how Vykers dealt with it now. I probably liked the first part of the book the best with Vykers in search of a solution for his predicament. But even after that the story remains interesting to follow. And even though the story doesn't have as many 'breathtaking' scenes as in the previous books, it still contains many great events, the ending being one of them (not as good as in the first book, but that battle will be hard to match). Very nice as well in the third book is that we finally get some answers on some of the many questions that have been building up in the series. Much remains unclear, but it is good to see that Allan Batchelder still knows what he's doing and that he knows to reveal some small hints at times, and give some larger revelations at others. The characters are still as great as in the first two books, we already had some great character development in those, and the writing is again top-notch. Also the world building remains very intruiging; a mystical world, strange races, great magic ... This is a great series that really needs to be read by every fantasy lover! I, for one, am looking forward to the follow up later this year!!! This series is an amazing series that deserves to be read. I read quite a bit and mostly fantasy and this is really better than some of the main stream books that are out there. I think his dialogue is quite literally some of the best i have read and can picture myself sitting around the fire and joking around with them. The world I'd interesting and constantly changing, he is definitely not an author that gets into his comfort zone and hangs out there. He is constantly moving locations, introdu This series is an amazing series that deserves to be read. I read quite a bit and mostly fantasy and this is really better than some of the main stream books that are out there. I think his dialogue is quite literally some of the best i have read and can picture myself sitting around the fire and joking around with them. The world I'd interesting and constantly changing, he is definitely not an author that gets into his comfort zone and hangs out there. He is constantly moving locations, introducing new threats, killing characters, and sometimes bringing them back. The journey had been amazing so far and the sequel is honestly a week one purchase for me when it comes out. As before, this book ends on a cliff hanger and you immediately want to pick up the next one. There are also revelations which leave you asking more questions . Holding on before picking up book four until book five is out, hopefully not to long. If you'd sit me down in one of those interrogation rooms -single table, two chairs on opposite sides, single light bulb above it; you know what I mean- and asked me to name a fantasy franchise similar to the Immortal Treachery series, then I would say it resembles Malazan Book of the Fallen (albeit in a condensed form). Praise indeed, as I regard MBotF as the best epic fantasy series out there. Sure, Batchelders books are nowhere near the size of Erikson's tomes, but the content shows quite some If you'd sit me down in one of those interrogation rooms -single table, two chairs on opposite sides, single light bulb above it; you know what I mean- and asked me to name a fantasy franchise similar to the Immortal Treachery series, then I would say it resembles Malazan Book of the Fallen (albeit in a condensed form). Praise indeed, as I regard MBotF as the best epic fantasy series out there. Sure, Batchelders books are nowhere near the size of Erikson's tomes, but the content shows quite some paralels; bizarre (but fun) magic, tons of interesting creatures and races, witty banter, great humour, Gods meddling in mortal affairs, explosive action. Now, normally I'm loathe to compare series from different authors, especially when the comparison is between an established bestseller writer and an indie author. However, I feel I can safely discard that inhibition whilst reviewing the Immortal Treachery series. It's just so freaking good. When reading some tracts I was actually more enamoured by Batachelder's books than by Erikson's. "Why is that"? You may ask. Well, for one, Batchelder doesn't waste time on a gazillion forgetable POV characters (something a lot of great fantasy authors tend to get caught up in). There's a cast of about 8 POV characters and all are interesting in their own right. Furthermore, Batchelder switches between these POVs with a remarkable timing; not so fast that you don't get engrossed in a character, and not with too big intervals, so you don't have the risk if getting fed up with a certain character. This is brilliantly done in my opinion and I'm gonna go out on a limb here and say I've never read any fantasy series where this was handled so well. I will not go into too much details regarding the plot, magic-system, world, characterization etc. Everything that was appealing in the first two books in the series is still present in Corpse Cold. For detailed thoughts on these aspects, I refer you to my reviews of Steel, Blood & Fire and As Flies to Wanton Boys. However, I do have some short remarks specifically about Corpse Cold: Vykers faces a truly taxing situation. Its the biggest pickle he's been in up to date. What ails our taciturn protagonist? Well, suffice it to say that he's somewhat 'out of sorts' (can't say anything lest I spoil it). But the Reaper shines as never before in Corpse Cold. New and old hitherto relatively obscure races enter the scene and bring a vibrant new impulse to the fantasy world Batchelder created. And Gods pop up left and right to cause mischief for mortals and fey alike. And Allan, you wretched, wretched man... did you study at the University of Insufferably Scintillating Cliffhangers or something? You can't just give us a revelation like that at the end of the story and expect your readers to keep their cool until book 4 hits the shelves! Argh! I'll conclude by saying I sincerely wish that the Immortal Treachery series becomes more widely known to the greater fantasy world. This series deserves to be read and appreciated by fantasy lovers around the world. I can't wait for book 4! Catching up on this series again. Great to revisit these characters! They felt like old friends. In this one there's a definite "revenge quest" (sometimes mixed with rescue quest) theme going on, with all kinds of characters furious at the damage they've taken from all kinds of others. But they come to a tangled common focus by the end of the volume, to resolve things once and...well, not exactly for all. Because another thing we're learning in this world is that even the dead have a way of comi Catching up on this series again. Great to revisit these characters! They felt like old friends. In this one there's a definite "revenge quest" (sometimes mixed with rescue quest) theme going on, with all kinds of characters furious at the damage they've taken from all kinds of others. But they come to a tangled common focus by the end of the volume, to resolve things once and...well, not exactly for all. Because another thing we're learning in this world is that even the dead have a way of coming back somehow (which is sometimes good--I was happy about one of them in particular! ), and that the gods are all around us but have limited powers and knowledge. My favorite aspect was watching these separated groups of characters meet up at last, some for the first time, some in at-long-last reunions. I got more emotional than I expected to at a couple of such scenes toward the end. We get to know the giants a little better in this one too, and they turn out to be possibly more civilized than most humans, which was cool and intriguing. You should read all of Allan's books. They are a great find. I'm just finishing up Book 3, it's four thirty in the morning and I couldn't stop reading. I have to get up at six am. On to Book 4! I enjoyed this installment in the Tarmun Vyker's saga as much as the first 2 volumes. Allan Batchelder's imagination continued to amaze and impress me. His characters, both human and fantastical beings, are well-conceived as is the story. I had a lot of fun reading this book. Allan is a professional actor, educator and former stand-up comedian. In addition to Steel, Blood & Fire, he's also written plays, screenplays, online articles, dialogue for computer games, greeting card sentiments and more. He holds a Master of Fine Arts in acting from the National Theatre Conservatory and a Master's in Teaching from Seattle Pacific University. He is a huge fan of Shakespeare Allan is a professional actor, educator and former stand-up comedian. In addition to Steel, Blood & Fire, he's also written plays, screenplays, online articles, dialogue for computer games, greeting card sentiments and more. He holds a Master of Fine Arts in acting from the National Theatre Conservatory and a Master's in Teaching from Seattle Pacific University. He is a huge fan of Shakespeare, Steven Erikson, Joe Abercrombie, Glen Cook, George R.R. Martin, Tad Williams, and R. Scott Bakker. Allan lives in Seattle with his wife and son, where he enjoys walks on the beach, reading in the garden and puttering around on his computer. Oh, and naps. He LOVES naps. Allan is a professional actor, educator and former stand-up comedian. In addition to Blood, Steel & Fire, he's also written plays, screenplays, online articles, dialogue for computer games, greeting card sentiments and more. He holds a Master of Fine Arts in acting from the National Theatre Conservatory and a Master's in Teaching from Seattle Pacific University. He is a huge fan of Shakespeare, Steven Erikson, Joe Abercrombie, Glen Cook, George R.R. Martin, Tad Williams, and R. Scott Bakker. Allan lives in Seattle with his wife and son, where he enjoys walks on the beach, reading in the garden and puttering around on his computer. Oh, and naps. He LOVES naps.